The U.K. has the fourth highest level of antidepressant prescribing in the Western world with prescription levels tripling since the millennium. Yet a study published in The Lancet earlier this year on the efficacy of these drugs suggests at least a million more Britons should be taking antidepressants. With mental healthcare becoming an increasingly important topic of discussion, Fire Productions brings the award winning The Effect to the North West. This Lucy Prebble play is about a clinical study on the effects of an unlicensed antidepressant on non-depressed, paid volunteers. The play explores whether Love really is the drug or if artificially elevated dopamine levels are indeed Viagra for the heart. Striking stage design by Louis Price creates a sleek and effective set that coupled with lighting by Adam Murdoch ensure that the production looks as good as the onstage performances. Scenes flow smoothly and concisely in this highly structured amd cerebral piece. The order and precision of the early scenes at the research facility are a smart foil to the messiness that unfolds as heightened emotions takeover. The direction by Jake Murray ensures empathy, passion and tenderness are infused into every scene whether it is dopamine infused euphoria or dopamine deprived despair. In this double blind study the lovers, young and old are under the spotlight as the audience observe the empirical and the more qualitative research approaches. Is this elevated mood and loss of appetite due to the dopamine in the drug or is it due to the exhilaration of falling in love? Does a relationship breakdown trigger a reactive depression or does a chemical imbalance in the brain cause depression and if left untreated can it cause the breakdown of a relationship? The young couple are utterly believable in their growing attraction and resultant confusion as they grapple with what is placebo and what is real in their relationship. As Connie, Elaine McNicol is all process driven, reflective and cautious as the curious, young psychology student whose emotional world starts to rapidly expand. Daniel Bradford really shines as Tristan. His Northern Irish accent totally fooled me and I’m from N.I! He brings a genuine lust for life to his character that is always engaging and when the drama unfolds he is truly mecurial in this role. He absolutely lives in the moment so when his character becomes trapped in the moment, it is painfully poignant to see all that joy and passion snuffed out; just as it can be in episodes of serious depression. The two doctors are middle aged and differ in their approach to the subject matter. Toby is the trial director who favours the science and sees medication as an effective means of regulating brain chemistry whereas Lorna sees things from a deeply personal perspective and wonders if depression can be a useful pain informing us that we need to change our lives. Both perspectives have validity as without enough dopamine in the brain we struggle to have the motivation to effect change which in itself can cause depression. Karren Winchester is wonderful as Lorna showing dry humour and resilience, she is always intensely believable as the deeply, emotionally invested psychiatrist. In the second act she excels as depression sets in and in her scene talking to the human brain she is chillingly reflective. Her portrayal of the toxicity and dissociation in depression is startlingly accurate. This is wonderful writing for any actor but Winchester really uses every word to self-flagellate. It is not surprising that many individuals suffering depression do not seek help as the voice in their own head can be so punitive that they simply don’t see themselves as worthy of assistance. The mysteries of the human heart and mind are enduringly complex and as interwoven as the formation of the brain itself. The Effect raises more questions than it answers but this is a conversation that will always fascinate and divide in equal measure. Sixty years on from it’s première at Joan Littlewood‘s Theatre Royal Stratford East Helen and Jo are doing another moonlight flit as A Taste of Honey opens at Oldham Coliseum. Traipsing through the auditorium with their flimsy suitcases and cheap coats you can almost smell the whiff of stale perfume, gin and despair as they pass. The creation of 18 year old Shelagh Delaney, this gritty Northern drama was penned in two weeks as a defiant young woman gave a voice to the women around her. Salford in the late Fifties was grim and this production speaks of the harsh reality of poverty, race and homosexuality in a post war working class community. It is a celebration of strong women making the best of their assets and getting on with life regardless of what fate chucks in their path. Director Chris Lawson clearly has great affection for the characters and seeks out their softness and humour as well as their grit and shrewish spitefulness. Gemma Dobson plays Jo as a fresh faced, teenager with traces of childish puppyfat who may despise her mother’s lifestyle but who is quick to clumsily adopt her coquettish mannerisms. The tragedy here is a child-woman growing up too fast as she seeks out a little attention and affection in a bleak environment. Dobson nicely threads the line between childish naivety and the bleak cynicism of one who has seen too much too young. Kerrie Taylor embodies the world weary Helen with a rake thin brittleness that on occasion lights up with the seductive sinuousness of Marilyn Monroe. This good time gal is bleakly aware that her 40 year old body will only do so many times around the block before it is discarded back in the gutter. There is little likelihood of cosy, happy endings for either woman yet they both retain pride and stoicism. The traditional men here are bluff, gruff and casually cruel like Peter who Phil Rowson plays with rakish energy as a drunken Spiv. The others who have not been to war are softer and kinder. Kenton Thomas brings a sweetness to sailor Jimmie who is charmed by Jo and her acceptance of his race but leaves without ever checking if she might be pregnant. Max Runham as the kindly art student who befriends Jo is delightful as he veers between wistfully “playing house” and desperately trying to fit into societal norms while waspishly expressing his true nature. Sammy Dobson has created a set that perfectly evokes a grimy, Northern street. All smoky brickwork and smoggy air with an interior of peeling wallpaper and nicotine colours. The threadbare furniture sags and creaks and retains its grimness even with the glamour of Helen flitting in or out, or the occasional brightness of a bunch of conciliatory flowers. The moments when the stars glitter through the roof is a clever touch bringing hope and magic into these gutters or perhaps the poignancy of fragments of broken dreams. The music here is another snapshot of this era of post war Britain just before the freedoms of The Sixties. The use of dance and movement to the music allows the scenes to flow and the characters to escape reality while a records spins on the turntable. Sixty years on from Delaney’s triumph there are sweeping changes in society and many of Salford’s grim back streets are gone forever. Watching the revival of this play brings cosy childhood reminders of watching black and white episodes of Coronation Street, however it is also a potent statement about today’s sanctions and the unremitting destruction of our social welfare system. If writing this play today, I imagine Delaney might have Jo and Helen at a food bank and queueing for a bed at a hostel for the homeless. The Kitchen Sink has a warm rich vein of humour with a steady flow of lively banter and acerbic quips. This is an undoubtedly upbeat take on some serious kitchen sink dramas. This is an Everyman, everyday family dealing with financial worries, plumbing woes; and managing disappointment, frustration, fear and grief. The kids are in flux as they try to find their place as adults. Dad is stubbornly clinging to a past that has no place in the future or even in the present. Mum is chucking lifebuoys to all and sundry in the shape of courgette muffins. In this scene of adversity there is also buckets of love and empathy. The Kitchen Sink is for everyone who has felt like screaming in their kitchen and it is an infectious reminder that we could be up on the kitchen table and dancing and singing along to Dolly Parton. The staging works really well and Anna Reid’s design conveys the shabby family kitchen in need of a complete overhaul. The faded oranges and beiges of this utilitarian kitchen are brought alive by the people who inhabit this room as in so many homes. The wonky Christmas tinsel and Billy’s incongruous portrait of Dolly Parton are the little touches that make this home unique. The lighting is clever as each scene changes in muted semi darkness as family life continues to ebb and flow with a steady heartbeat of home and hearth. The family are Northern working class with Kath, a feisty Mother who works two low paid jobs and yearns for change and rails against stagnating in a place that is a good place to come from, but not a good place to end up. Sue Devaney plays Kath with an infectious energy which never dims. She works hard at family, at work and in life but she is never a martyr but instead retains a kittenish, playfulness whether stripping off unto a newspaper or casually savouring her first spliff. There are moments where I wished the laughter dialled down a little to allow more space for her heartfelt plea for just a tiny change without the World ending. The poignancy and tenderness in the scene in which Kath has made the buffet for Pete’s Gran’s funeral is a joy to watch. The simple compassion of a Mother who loves to “mother” being “Mother” to the bereaved and orphaned Pete. William Travis provides a dour, slightly gloomy Martin who is a good foil to wife Kath. Initially they seem ill- matched as her sunny playful nature seems at odds with his downbeat gruffness. Yet the moments of real laughter between the two shine as their strong emotional connection is evident. This is marriage at its best- there is humour, forbearance, compassion and earthy attraction. They may have a barely half-filled jar of 20 pences as savings security but they have a fortune in a rock solid union. The children are less richly drawn. Billy played with great sweetness by Sam Glen, is ill equipped for Art College in London where his heartfelt homage to Dolly Parton is greeted as “kitsch” and “cool”. His warm and affectionate relationship with his mother is spontaneous and full of horseplay which belies the more awkward one with his father. This is a home where children are undoubtedly loved but where an artistic, gay and slightly diffident son is slightly held at arms length by a father who struggles to relate to him. Sophie played by Emily Stott is barbed wire brittle and is clearly a wounded soul. Her Mother senses something is wrong and Sophie is clearly very close to her father yet no one seems able, or dares to probe too deeply. Perhaps in every family the dark stuff lying at the bottom of the U- bend is avoided where possible. Like the makeshift mends on the kitchen sink until it finally erupts and make do and mend is no longer an option. The most finely drawn character is Pete the young plumber and would-be suitor to Sophie. David Judge delivers a beautiful performance full of awkward grace and sensitivity. The quiet resilience and steadfast devotion to those he loves is a study in grace and gentleness. Despite or because of his own losses, he is the only one to really see Sophie’s pain and try to help her. This play subtly highlights how children can be loved and valued but sometimes “missed” in the business of making ends meet with multiple jobs or unsociable working hours. The Kitchen Sink is filled with the music of Dolly Parton. This is a soundtrack full of songs bursting with energy and poignant, heartfelt melodies- a perfection reflection of this family at this particular kitchen sink. In the ladies loos after the show both cubicles were engaged with girls singing Dolly at the top of their voices!! I’m not a country music lover but I’ve been playing her all week. Small changes. Thanks Kath!! As the character says I got on the Circle Line in the wrong direction- Nothing happened- I just sat it out. This play has an ask for all of us. Do we want to sit it out or get off and go a different direction and see what happens. 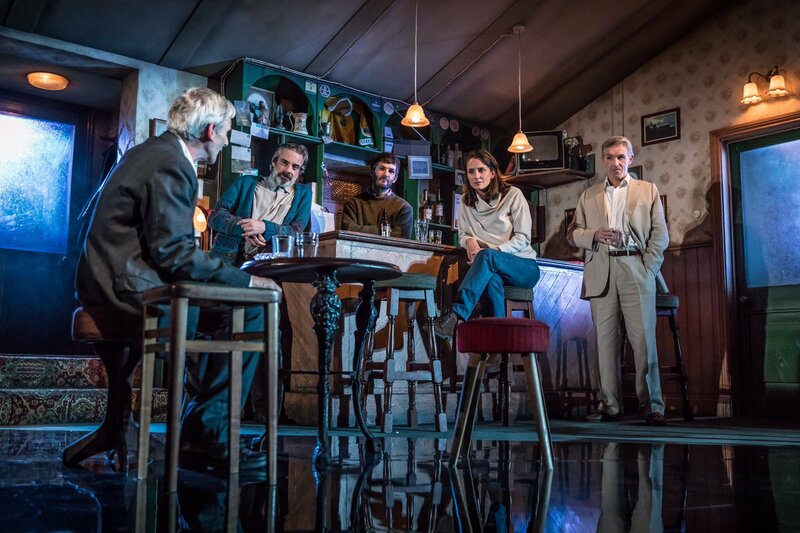 First staged at the Royal Court Theatre twenty years ago, The Weir remains an exquisite example of story telling on every level. From the first moment of this remote Irish pub opening for business to the closing of the door and dimming of the lights this is spellbinding theatre. Nothing really happens in this quiet bar throughout the evening and yet this a night that will be woven into the local story telling traditions in years to come. The themes of loneliness, stoicism and loss are entwined in how much identity in rural Ireland is defined by the land and family. The four men are all from this remote part of County Donegal. The young publican Brendan and his regulars Jack and Jimmy are seemingly resigned to their solitary lives. Their individual obligations to Sisters, to the Mammy or to maintaining the local vehicles define their identities in this small isolated community. Finbar has got out, left the loneliness for marriage, commercial success and life in the neighbouring town yet he seems the most vulnerable of the four men. Newcomer Valerie has “blown in” seeking solitude as a panacea to grief. The sharing of old stories and myths intertwined with lived experiences connect all five in ways that soothe that inner loneliness, and beautifully reveals the sensitivity in each of these four awkward local men. The relationships between the characters are perfectly pitched to reveal all the subtle elements of their shared history in this community. Growing up in a rural Irish village I knew every man on the Stage and every worn barstool and smoke stained lamp and old photo on the walls. The actors personify their characters as though they have drunk them in reflectively like a pint of stout or Harp. When Valerie occassionally jars in the gentle pace it is only because she is an outsider, blown in from the big city. As drinks are drunk and stories are told the magic of small lives richly lived is evident. This bar has no need of a jukebox, the tiny television is unused and nothing more is needed than the human voice and the wind singing under the door.